They may be about as relevant in the UK as a 50ft Winnebago or eight-litre SUV but, if you hadn’t cottoned on already, ‘baggers’ - or be-bagged or panniered cruisers designed for comfort and custom style and, usually, also with Plexiglass screens, a relaxed riding position and footboards instead of conventional footpegs, are big news in the U S of A. Historically it all (probably) started with the Harley-Davidson Road King and romantic images of a never ending stretch of road in the deep south heading towards a shimmering horizon; a cruisers’ dream to head into the sunset; touring in relaxed comfort with a huge V-twin barely ticking over, thumping away between your knees. Which is probably why the ‘bagger’ class has in recent years proved so popular (particularly in the US where numerous magazines, shows and more are dedicated to them) and there are now so many to choose from. Obviously Harley and Victory have baggers in their line-ups, but so too, in the US, do Yamaha/Star (with the V Star Tourer, Deluxe and five or six more), Honda (with its new 1300 Custom and F6B ‘Wing), Kawasaki (VN1700 Voyager and VN1700 Classic Tourer) and even Triumph (Rocket III Touring) and Guzzi (new California Touring). Obviously few of these bikes make it to the UK but even so it was clear Suzuki was lagging behind. Hence the new C1500T. The flip side of that is Suzuki’s had plenty of time to suss out the opposition and do its homework. The twin bags have been integrated neatly into the design and have the same finish as the seat, which is a nice touch. They also feel robust and solid. On the downside, they aren’t detachable nor are they large enough to accommodate a lid. However, they do open really wide for easy access. Suzuki says they’ll carry 50.5l of luggage and there’s an optional rear rack with sissy bar if you want to carry even more. These panniers also feature a small cut out so they don’t get in the way of your pillion’s legs. However the rear pegs are rather high. Suzuki has also fitted a small crash bar to the left hand side to protect the luggage should it fall over, which, unfortunately, I managed to test after embarrassingly toppling over at a standstill. The crash bars did an amazing job and the bike was virtually unscathed. You’d certainly never have guessed it had been on its side with both wheels off the floor! 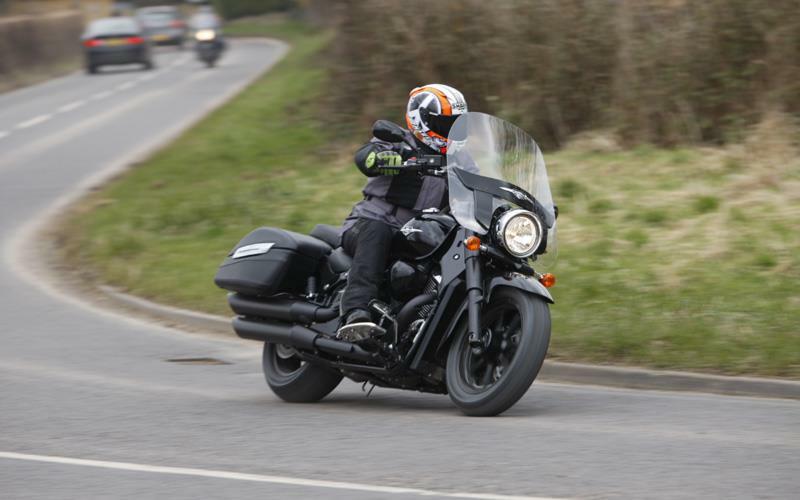 Up front, the new bagger is much more comfy than the M1500 (its closest sibling), with which it shares its motor and chassis but with a large, factory-fitted screen, bars which are closer to the rider and narrower and footboards for its heel-toe style gear change. The seat is also new and longer to allow more movement, so you can lay back and enjoy the ride. The clocks have an analogue speedo, but no rev counter. However, they do have a digital clock, twin trips, a digital fuel gauge and gear position indicator, which is a nice touch. Styling-wise Suzuki has ticked all the bagger boxes and done it all for just £10,999, which, compared to the opposition, makes the C1500T a hell of a lot of bike for the money. The Suzuki’s styling might not have the grace or classy finish of Guzzi’s new California, but it’s £5000 cheaper. 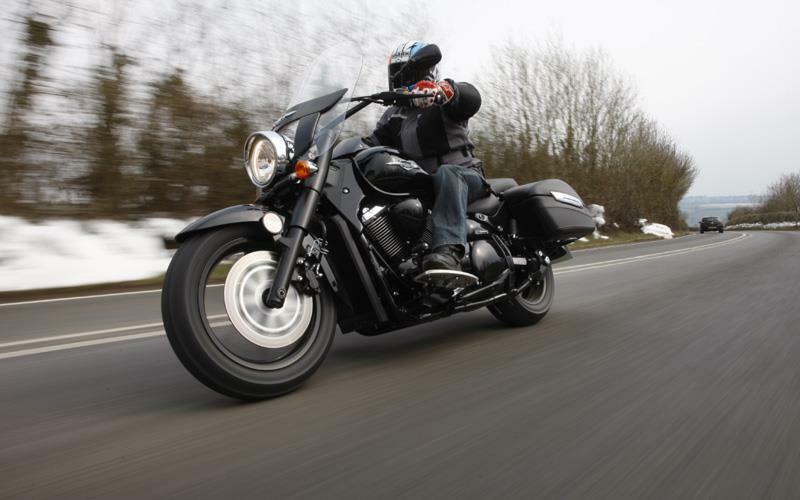 It also doesn’t have the mean road presence of Kawasaki’s Voyager Custom but again it’s £3000 less. Yes, in one or two areas you can see where Suzuki has saved money. Of course, asking just that single disc to haul up the Suzuki’s full 363kg may be an economy too far for some. Simply, the single disc just can’t cope by itself although, when combined with the rear (which feels almost as strong) it gets by. Suzuki has fitted a slipper clutch to ease the massive amount of engine braking from the huge V-twin but I’d still rather have another disc and optional ABS instead. But if stopping is a problem going forward on the C1500T certainly isn’t. Let the revs build and the big V-twin lifts up her heavy skirt and wants to run. In fact, the big girl has a surprising kick once the revs build. On the downside, it doesn’t drive from really low down; there’s a slight hesitation and it simply doesn’t have the grunt of its rivals. The big 1462cc lump happily pulls 50 mph in 5th gear or even 40mph in 4th. But below 40mph in fourth gear it feels really sluggish. For such a big V-twin I want arm-ripping torque from tickover. Higher up, the fuelling is faultless. At cruising speeds it’s super smooth, and below 75mph you’re out of the wind blast thanks to the huge screen. Approaching 80mph you start to get a slight buffetting but no matter what the speed the engine is silky. It’s just a shame the exhaust note is so silent and characterless. It’s strange; when you’re riding the new Suzuki it sounds very quiet, but when one rides past – as they often did during our press test – it sounds rather meaty. Ride comfort is like the proverbial magic carpet with the suspension wallowing along at a steady pace. Obviously if you wind up the pace you soon find its handling limitations, but that’s not the point of the big cruiser. Suzuki is claiming a real world MPG of 53.38 which equates to a potential 212 mile tank range. In many ways the new C1500T is a very attractive proposition. At £10,999 it’s a hell of a lot of bike for the money, especially as the closest Japanese competition comes from Kawasaki in the shape of its VN1700 Voyager at £14,599. If you want an American bagger from Victory or Harley you’re going to have to shell out £16,000 or more. On price alone custom cruiser fans are going to be knocking down Suzuki showroom doors. But that’s not the whole story. The C1500T also looks the part, ticks all the bagger boxes, has an engine that is smooth with plenty of grunt once you twist the throttle far enough, is comfortable, could take on some long distance touring no problem and, according to Suzuki, is good on fuel. However, it does have its faults, the brakes are poor, it lacks real low down grunt and it doesn’t have the character of the competition – but it is the cheapest in this segment by far. 2012 Suzuki GSX-R1000 first ride: "So easy to ride"
The launch of the new Suzuki GSX-R1000 is currently underway at the Miami Speedway track in America. "Although shunned as a Harley clone, it is, in every respect apart from lacking character and soul, a better machine"
"Strong, reliable and with pretty funky handling for a cruiser"